The most effective way to control weeds is to continually use some type of ground defense. There are two types of herbicides used for weed control. For weed that have already begun growing and are an eye sore the herbicide used is called Postemergence herbicides. There are both liquid and granule type of Postemergence herbicides. While the liquid may work the quickest the dry granulated herbicide is most practical for homeowners to use. These have the best outcome when used on weeds that are young and rapidly growing. 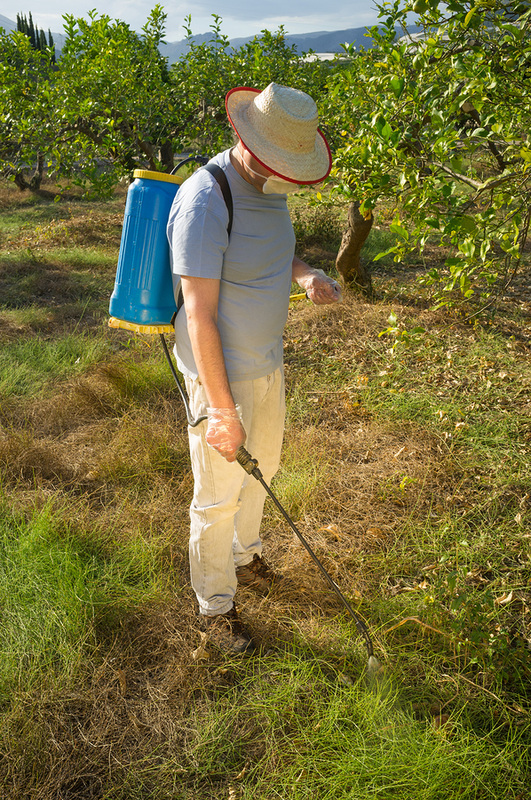 The second type of herbicide used for weed control is Preemergent herbicides. This herbicide is used on germinating seeds, and work best against annual weeds. Preemergent herbicides should be applied two to three weeks before the weed germinate for best results. When planning to plant a garden please remember that at least twelve months before planting a garden it is recommended that the soil be sprayed to begin killing weeds. It is much easier to take care of the weeds before hand and give the plants a better chance of survival. Rather than not treating and leaving your plants to fight for survival when nine times out of ten the weeds win. Also, when treating plants using a weed killer is ideal for most homeowners due to its effortless application. Otherwise, be sure to have the Tylenol handy because more than likely the day will be spent pulling, prodding, and digging out weeds whose roots vary from surface to multiple feet deep. Weed control will also save you money by keeping weeds away from plant so it won’t need replacing. There are multiple benefits to weed control. Weeds can be a real problem for your landscape, backyard, lawn or garden. If they are not controlled, these weeds can overtake a garden and choke fruits, vegetables, and flowers causing them to die. Don't let this happen to your beautiful garden. You can rely and trust Elkhart Landscape For Weed Control. We offer very affordable prices and ensure that each client is 100% satisfied. Our landscaping company is highly concerned about the environment, the safety of our employees, our clients and their surroundings. This is why we offer environmentally friendly natural weed control services. Our certified landscape contractors have been extensively trained and have the knowledge and experience to provide clients this special service upon request. Our landscape professionals have been highly trained in weed identification. They can determine the identity and name of plants that are poisonous and need removal. They are ready to help you identify the weeds that should be removed or controlled from our landscape, backyard or garden. Our weed control products we use are of the highest quality top name brands. Sometimes weed control in lawns or gardens can be s very tough job and a complicated process if you attempt the job alone or have no experience. Sometimes weed control involves pulling weeds by hand depending on their locations, root depth, and more. Weed control on flower beds is very essential for the flowers to grow, be healthy and vibrant, and reproduce. You can depend on us to do an excellent job. We offer seasonal services to our clients so we can monitor and manage weed growth. Our clients we have gained trust and rely on our high quality weed control services to help them keep their landscape. lawns, and gardens beautiful all throughout the year. Our professional, licensed, and insured weed control service will allow you to save time, money, and hassle. We are committed to ensuring that each client receives the highest quality of weed control services. Other landscape companies cannot be compared to our expert weed control services, prices, or guarantees. We can use specialized weed control fabric to keep weeds down for good. Our professional landscape contractors have been trained in the placement of weed control fabric. We provide our professional landscape and weed control services to both residential home owners and business property owners. You can make a great investment by adding value to your property with professional weed control services. Contact us for an excellent weed control management plan for your property. If you own a business and have it landscaped with a garden, then we can help you protect its beauty year-round. Need some advice and tips on garden design? Elkhart Landscape For Weed Control can help provide you with some great ideas, inspiration, and creativity for garden design. At the same time we include tips and advice for weed control. ​You love your yard, and you need to know that it will always be beautiful. You love the look of fresh grass and the greenness that it possesses. You love flowers that bloom in their correct areas, and you love having a yard that is perfectly maintained. One thing that you do not love as much as you love everything else is the weeds that can become a part of your yard. You don't enjoy dealing with the weeds, and you don't like trying to remove them on your own. You are in need of a weed control service. You need to know that someone will handle the weeds that are a part of your yard so that you don't have to deal with them on your own. Elkhart Landscape is available to give you the weed control care that you need that will be right for your yard. What does Elkhart Landscape Offer to Your Yard? You are seeking out someone who will provide you with natural weed control and help you keep your yard in good shape. You are looking for someone who will provide the weed control products that will be good for your yard and safe for use. You will find that Elkhart Landscape offers all of the products that you are seeking and the kind of helpthat will be good for your yard. You can have your weeds removed to keep your yard in control, and that can be done through the help of a natural weed control product. You are trying to find someone who offers weed control in lawns and who knows how to do the work in a way that leaves the yard looking beautiful. You need to know that the company you turn to for help is experienced in weed identification and can do things for you in a good way. You are looking for a quality weed control service, and that is just what Elkhart Landscape offers. You deserve the best care for your yard and grass, and you can get that. You are seeking the right kind of weed control flower beds. Your flower beds are in need of help in order to get the weeds out of them and keep those weeds out. You need help in this area, and you want the best help to keep your flower beds beautiful. You will find that Elkhart Landscape offers the care that you need to get your flower beds in good shape. You will find that there is weed control fabric out there that can help you keep your yard looking great and free of weeds. There is assistance available so that you can have beautiful flower beds. When you are seeking help in the area of weed control, you need to find a company that can help out with your yard and your flower beds, and you need to know that the company that you choose is a quality one. Elkhart Landscape offers professional care for your weed control needs.